You just bought your first house or just need to spruce up your back yard, but don’t have a large amount of cash. A few simple ideas that will keep your cash in your wallet and the needed landscaping your backyard deserves. How to landscape a backyard for cheap? Many of the materials can found for free or just a few dollars. You also find these items at local big box retail store, or home and garden store. Used tires can be found just about anywhere. I have seen them next to dumpsters at my local grocery store, next to the side of the road, junk yards, and yard sales. Bury your tires half way into the ground and create a place to sit, or in row and make a mini obstacle course. Can also be used to section off a sandbox or a tree swing. Stack a few tires together and create a mini garden bed, that will have a few tiers to plants herbs, flowers, and variety plants. Tires can be painted to match house colors, or match a decorative theme. Building and landscaping with pallets has become a popular way to create a feature for almost nothing. Pallets are used excessively for commercial cargo transports all over the world and can be found at any warehouse or distribution center. Most of the time pallets end up in recycling or trashed. Basically free building materials. The wood from pallets can be broken down into plank and rebuilt into wooden planters. Building elevated garden beds using whole pallets as building blocks. 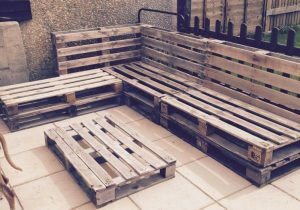 Creating furniture using pallets. Take 2 whole pallets as arms and the base for a back yard couch. Add some some cushions and you have a lawn couch. A cheap and durable cinder block gives you many options for your backyard.. Each one costs a little more than a buck, and with a little creativity can be used in numerous ways to enhance your backyard. Use cinder blocks as planters for small flowers, herbs or any combination of plants. Blocks can be used to create a elevated beds. Use cinder blocks create a quick and easy fire pit. You can frequent garage and yard sales for items that would fit your taste and imagination. Often these items are only a few dollars and the best part is the bargaining. Who doesn’t like a good deal? Using old drawers or tool boxes as potting containers. Old shoes for planters on a fence. Old ceiling fans for your patio. The goal is to create something cheap and very comfortable. These are merely three ideas for you landscape, but with a little research from your favorite aearch engine you can find many more ideas!